Birdo is the boss that you will face more often than any other boss. There's actually a variety of Birdos that you will encounter. Pink Birdos can only shoot one egg at a time. Red Birdos can shoot three eggs at a time, but they may spit fire at you as well. Green Birdos will shoot nothing but three fireballs at you. Both red and green Birdos perform a small hop between their shots. Birdo prizes the crystal globes that are needed to exit through the gates that connect each world. You'll have to convince her to let them go by hitting her three times. Normally, you may not have anything at your disposal to throw at her, but if there are Mushroom Blocks available, you can use those. Otherwise, you will have to give her a taste of her own medicine by catching the eggs that she spits at you and tossing them back at her. When she fires an egg, quickly jump up and land on top of it, and press to pick it up. Then when the time is right, throw it back at her. After the third hit, she will give up the crystal ball. In the instruction booklet, Birdo's name is accidentally swapped with the Ostro monster. It also has this description: "He thinks he is a girl and he spits eggs from his mouth." This reference indicates that there was either a mistake with Birdo's gender, or that Birdo was originally a boy, or that Birdo was transgender. This is as far as you go! I'm ready for you this time! Also, when Birdo takes damage, she yelps, and when she dies, she cries out in pain for a longer duration (she may be mumbling "I'll be back some day" or "I'll remember this"; it is hard to tell). When any version is killed, you get 2000 points. Super Mario Advance's Red Birdo. SMA's Green Birdo (animation only works in Firefox). Birdo art from the NES game manual. Mouser is up to no good. He hangs out at the end of a couple of worlds, just waiting for Mario and crew to arrive so that he can put an end to their adventures. His weapon of choice is bombs. He will light up a few and toss them down at the floor below his platform. In order to defeat Mouser, you'll need to fight fire with fire and toss some of the bombs back up to him. He won't get hurt if you hit him with the bomb, but he will get hurt if he is caught in a bomb explosion. Remember that if you're quick enough, you can catch the bombs that he throws right out of the air. The first time you encounter Mouser, it will take three bomb explosions to make him quit. The second time you encounter Mouser, it will take five. In Doki Doki Panic you will actually encounter him a third time at the end of the fifth world instead of facing Clawgrip, who was added just for Super Mario Bros. 2, and it will take seven bomb explosions to defeat him. The instruction booklet's description says, "It is a bomber of bad dreams that destroys good dreams. It is proud and it doesn't believe that it is just a mouse." Mouser art from the NES game manual. Fryguy is the fiery boss that resides at the end of the World 4, the coldest world in the game. In Super Mario Advance, he says "I'm too hot to touch!" when he appears. He's no pushover, and you would do very well to stay far away from him as he hovers around the room in a figure eight. The sides of the screen wrap around, so you can easily transfer to the left side of the room from the right side, and vice versa. Fryguy only spits fire at you, so you won't be able to catch them and throw them back at him. Instead, you'll have to rely on the Mushroom Blocks arranged around the room. The safest place to toss blocks at him from is the top, but you'll have to safely reach the highest platforms to do so. Any place is safe to attack from as long as you don't linger too long when Fryguy gets close. After hitting him three times with Mushroom Blocks, he degrades into four small flames, each of which must be extinguished by squashing them with blocks. The flames jump higher and faster as each one dies, so if you leave one for last, it will be more dangerous than the whole group of them together. Once all of the flames have been snuffed out, a door will open, allowing you to advance to the next world. The instruction booklet's description says, "Wart gave life to this entity which is created from fire. He spits fireballs when he is mad." Fryguy art from the NES game manual. You must face Triclyde twice in the game; once at the end of the second world, and again at the end of the sixth. This three headed snake may seem like a fearsome foe at first. His attack consists of a fast stream of fireballs. The only weapons you have at your disposal to attack with are Mushroom Blocks. But your greatest offense can also be your greatest defense. Before you begin trying to hurl blocks at Triclyde, it's not a bad idea to create a little shield for yourself by stacking the blocks into a tower. Then you can stand behind the tower while you prepare to attack, as his fireballs smash harmlessly into the blocks. Once your tower is set up, hop up to the top and toss Mushroom Blocks at him in between his attacks. Once you hit him three times, he will give up and reveal the door that leads to the next world. The instruction booklet's description says, "He was once an outsider, but now he is one of Wart's helpers since he impressed Wart with his cunning brain and offensive capabilities which are three times normal strength." Triclyde art from the NES game manual. NES name: Clawgrip or Clawglip. 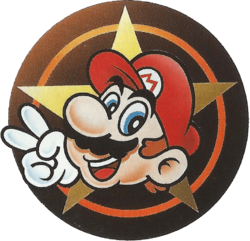 Clawgrip is a boss that was exclusively created for Super Mario Bros. 2. He did not appear in Doki Doki Panic. You will only face him once, at the end of World 5. Clawgrip is a giant crab that has a fondness for chucking boulders. Naturally, Mario and crew can collect these boulders and toss them back at Clawgrip, but it's not that easy. For one thing, Clawgrip is strong, and he tosses the boulders quite fast. After they've bounced off the walls or the floor for a while, they slow down and become easier to collect, but Clawgrip will probably be sending off the next rock by that time. To make matters worse, there's a pit in Clawgrip's chamber where uncollected boulders fall. If you're not careful, you might end up trying to pick up a boulder just as it's about to fall down the pit, taking you with it. Once you get the hang of Clawgrip's attack pattern, you should be able to collect the boulders and toss them back at him. Five hits will make Clawgrip surrender and expose the door to the next world. The instruction booklet's description says, "He grows suddenly, and he is surprisingly skilled at throwing rocks." Clawgrip art from the NES game manual. Ordinarily a passive gateway between worlds, there is one Hawkmouth gate that will come to life and attack you inside of Wart's castle. It floats through the air at a fast rate of speed and homes in on your character's position. Unless you are quick on your feet and change your altitude rapidly, you are almost sure to get hit, so don't stand around. Naturally, you will need to make use of the Mushroom Blocks found in the hallway to attack him. After he gets hit three times, he will come to a stop and open his mouth for you to pass through. However, if you delay and give him a chance to recover, he will shake off his stun and proceed to attack you again. Don't hesitate! There is no mention of this boss in the instruction booklet. This is Wart, the cause of all the trouble in Dream Land. He absolutely hates vegetables, and has stolen the world's harvest in an effort to get rid of them. He created the "8 bits", all of the monsters in the game, by using the dream machine. A machine in his throne room, likely the dream machine, is constantly ejecting the vegetables that have been stolen and stashed in the castle. If you manage to invade his castle and get past all of his traps, he will confront you and try to stop you with his bubble attack. Every now and then, he will open his mouth to take a breath before firing a series of bubbles at you. When you see this happen, this is your chance to catch a vegetable that pops out of the machine and attack. Wart can easily deflect any vegetable thrown at him, but when he opens his mouth to take a breath, you will have a chance to pop a vegetable in his mouth. For someone who hates vegetables as much as Wart, this will make him gag. If you manage to pop a total of six vegetables in his mouth, he will finally be so sick to his stomach that he will give up the fight and surrender. The instruction booklet's description says, "He is the most mischievous of all in the world of dreams. He created monsters by playing with the dream machine." Wart art from the NES game manual. ↑ 1.0 1.1 1.2 1.3 See the instruction booklet, page 27. ↑ 2.0 2.1 "Clawglip" is the misspelling of "Clawgrip" as seen in the NES credits. ↑ 3.0 3.1 As seen in the GBA credits. ↑ 4.0 4.1 4.2 4.3 See the instruction booklet, page 28. ↑ See the instruction booklet, page 23. This page was last edited on 20 June 2018, at 16:26.